Never underestimate the power of a good suit. Just ask Dress for Work client, Con Karaiskakis from Sydney. Con, a qualified accountant, experienced severe depression following the breakdown of his marriage. Although years have passed since the breakdown, Con continues to grapple with the host of mental health issues associated with the breakdown, including his inability to connect with his children. For Con, it is clear that his children are his world. The breakdown led him on a downward spiral, including a complete loss of motivation and even at one point, homelessness. 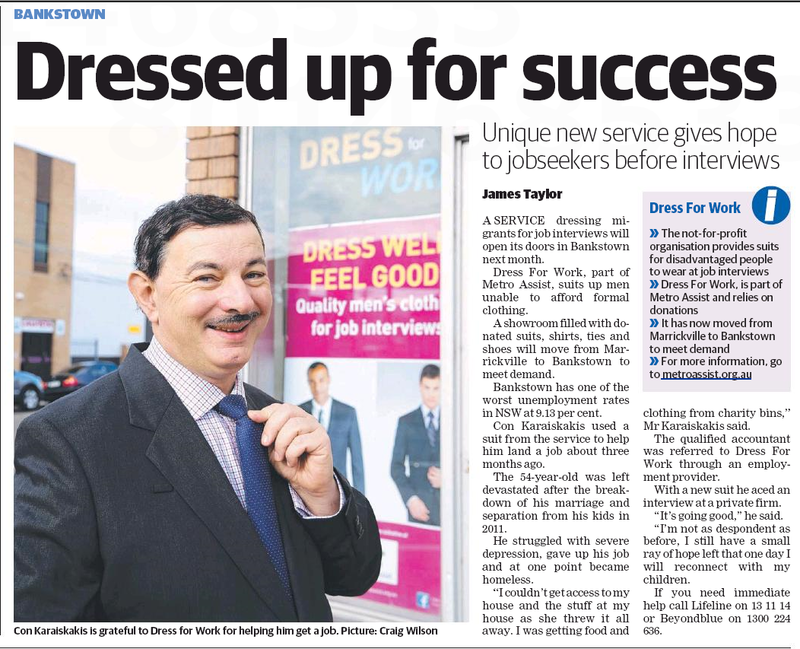 Dress for Work is a not-for-profit organisation relying on the kind donations of the community to dress men who are in financial need for job interviews and important appointments. Con first attended Dress for Work three months ago, where he was issued with a jacket, trousers and a shirt. At the time he required the suit to attend a job interview for an accountant position for a private firm located in the city. Asked where he would be if Dress for Work did not exist, he smiles meekly and replies “I just don’t know”. Con stated that he would often look through bins outside charitable organisations to find clothing, only to find that the clothes were almost always for women and children. As it so happens, Con did secure the role with his Dress for Work suit and continues to be employed today. Con attributes his employment as one of the factors which saved him from tumbling even further into his downward spiral. “My job gives me a much needed social aspect to my life now and keeps me occupied”. Con stated that he was grateful to Dress for Work for providing him the suit to get him to the job. Con’s story was featured in the Canterbury -Bankstown Express, to read the full story please click here. Look at this man! Look at what he has been through, that somehow got him through your doors, into the work of love that you do…and look at the radiant result! That man has transformed not only the way he looks…but in the way he sees himself. This is profound work you do Dress for Work! Thank you Mike for your wonderful words of support and encouragement – the Dress for Work team always loves such wonderful feedback!